Clodagh Gray with Marie Therese Boland and Niamh Bergin. Clodagh looking healthy and happy at her 21st birthday party with some of her Irish Dancing friends: Sinead Noonan, Leanne Diviney, Maria Noonan and Jackie Callaghan. Clodagh celebrating her 21st birthday recently in the Longford Arms. She is pictured above (third from the right) with her school friends from Mean Scoil Mhuire: Ailbhe Farrell, Ciara Hanley, Tara Nevin, Niamh O'Meara, Aishling Greene, Clodagh Gray, Louisa Duggan and Shelley Gray. Clodagh Gray with Donal and Pauline Gray, Anne and Derek Creighton, Orla Noonan, and Mairead Loughlin. All smiles: Clodagh with her loving Granny, Mary Jo Gray. Life is for celebrating and nobody understands that quite like Longford town lady, Clodagh Gray who recently enjoyed her 21st birthday party, surrounded by all of her friends and family in the Longford Arms. And this birthday party was so much more special than your average 21st because, if a few things had gone differently this year, it might not have happened at all. 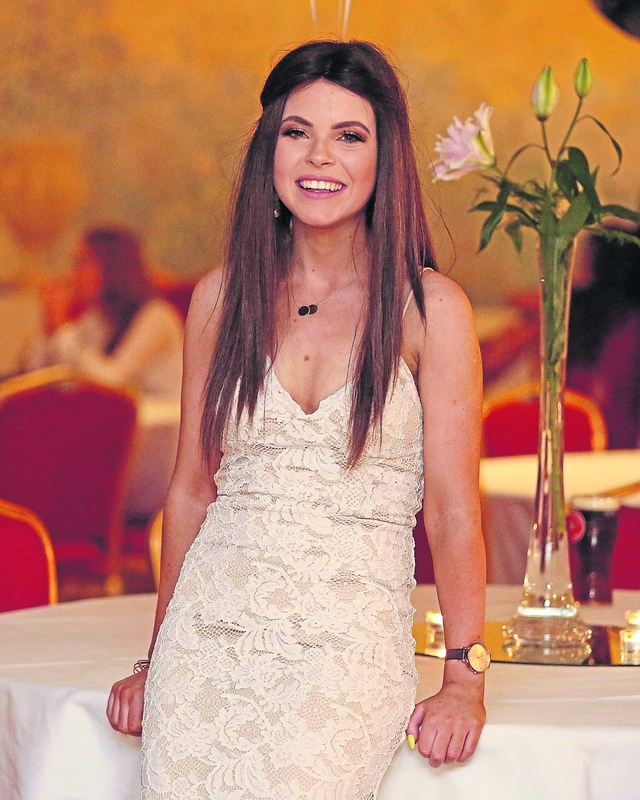 UCD Physiotherapy student and dancing addict Clodagh Gray was diagnosed with stage four Lymphoma in January of this year, bringing her whole life to a standstill so she could focus on just one thing: living. “I was doing my work placement with Miranda Moran and she was absolutely amazing. I had such a great time there,” Clodagh cheerily told the Longford Leader on Friday, looking healthy and happy and wearing a headscarf and, by her own admission “crazy eye makeup” for her Electric Picnic weekend. “All the guys looked after me so well. They treated me like I was one of their own. I didn’t feel like a student at all, even though I was completely out of my comfort zone, because I’d never done anything like that before. “Miranda brought me to county training, so I was massaging all the county men,” she laughed. Everything was going well for the aspiring physiotherapist until things took a turn. “It was actually that week that I was on my work placement that I was diagnosed,” she recalled. Approximately four years ago, Clodagh's cousin, Lisa Cullen, passed away tragically in a car accident. Lisa ran the Stanley Carroll School of Dancing, which Clodagh, along with her mum Pauline and dance instructor Annette Doolan, took over, renaming it the Doolan-Cullen school of Irish dancing. “It was a really tough time. But Irish dancing has always been a part of my life, ever since I was three and it was actually Lisa who introduced me to it,” she explained. On top of teaching kids at the dance school, Clodagh was involved in Catherine Young's contemporary dance production, 'Welcoming the Stranger', which was staged in the Backstage Theatre before Christmas - around the same time as her UCD exams. It was all of this combined stress that initially brought Clodagh to the UCD campus doctor in December. “I had developed an external itch,” she said. “I never really passed much remark on it because I had a hectic schedule and I just didn’t have time to deal with it; I had to do everything else and thought it would go away itself and it would be fine. The campus doctor eventually came to the conclusion that Clodagh was anaemic, due largely to all the stress she was putting on herself. “I was happy out that I’d found the cause of this itch and I thought ‘great, we’re on the road now to getting a solution and having a good night’s sleep’,” said Clodagh. “So, because I was so busy for those two weeks, it kind of just slipped my mind and I sort of trained myself not to let it bother me. “Then Christmas came and I just didn’t want to go out with my friends and I thought ‘God, this isn’t right’. Usually, I’d be so excited to meet up with my friends. This unusual lack of interest in social events was what sparked Clodagh's decision to visit her own GP, Dr Kevin Flanagan, who did another blood test. After learning that Clodagh had suffered from a chest infection that Christmas, he instinctually insisted that she get a chest x-ray to check it out. “So my dad brought me down for the x-ray and I was in and out in two minutes and I remember coming out and saying to dad ‘that was such a waste of time - they’re not going to find anything from that except that I had a chest infection’,” she said. It wasn't long before she found out that those two minutes were the most important in her life. Soon after she got home from the hospital, Clodagh's mother received a phone call from Dr Flanagan who delivered the bad news. “He just said ‘Pauline, I really don’t know how to say this over the phone and I’m really sorry to have to do it over the phone, but I’m afraid something has shown up on Clodagh’s x-ray’. “So then he said a growth had shown up on my lung. He obviously didn’t want to go into detail of the growth over the phone. Everything was a whirlwind for Clodagh from that moment onwards. “We didn’t think it would be so quick. But the whole process was so quick. Everything just happened: bam, bam, bam,” she said, clicking her fingers with each 'bam' for emphasis. The next day, Clodagh went to Mullingar Regional Hospital where she had a CT scan, a needle biopsy in her neck and a bone marrow biopsy - something she says she will never forget. “That was the one thing that will stay in my mind forever,” she said, cringing as she recalled the difficult procedure. “It was the most painful thing ever. The only way I can describe it is like de-coring an apple. So you have your apple and you get your decorer and you just twist it in the whole way down. “And because it’s bone, you can’t give an anaesthetic to it. I couldn’t feel the needle going in but as soon as it got in, it was making its way round and it was so uncomfortable. “So once that was over I was like ‘right, if I can do that, I can do anything’. So it was nearly my incentive to say ‘come on, stand up and just go for it’. ABOVE: Clodagh enjoying her big night out with her parents and her siblings in the Longford Arms a couple of weeks ago. Pictured are Donal Gray, Aoife, Aidan and Clodagh Gray and Pauline Reilly Gray. And, while she did finish her placement, Clodagh was devastated to learn that she would have to defer college for a year so that she could focus on getting better. “When they said that, I could not imagine not being with my friends in Dublin; not being able to dance in Dublin; not being able to do my physio,” she said. The following Friday, Clodagh started on the difficult road to recovery with an aggressive form of treatment that would end in a stem cell transplant in St James' Hospital, Dublin. “I had three days of treatment for three cycles and I have to say even when I was in the hospital, the people that I met were absolutely amazing,” she said. The chemotherapy was followed by a six-week break during which Clodagh ate delicious food, spent time with her friends and rested to prepare herself for a month of isolation when she would undergo the cell transplant. “I was so far away from everyone and anyone and I’m such a social person that I couldn’t imagine being completely by myself for a month,” said Clodagh. “That was the hardest month of my life. Looking back on it now I think ‘God, how did I do that?’ If someone had told me exactly what I was going to go through I would have said ‘no, I can’t do that’. But I did. It was during her month of solitude that Clodagh really hit her low point. With her stem cells removed and five days of high-dose chemo under her belt, she was weak and exhausted. When the time came to return her stem cells, Clodagh was terrified. “That was such a scary day because generally the stem cells do become compatible with your body and they start to adjust very quickly. But it all depends on your blood counts. “So it started to work for me and I was absolutely delighted. And there was word that I could get home a week early and I was so thrilled with myself. “And then all of a sudden, the blood counts were back down and I was back in for the week. “I was being so good for the whole time, trying to stay so positive. But at that point, I was so ready to go home. I just didn’t want to be there anymore. But Clodagh knew that, despite the misery she was feeling, the only thing she could do to help herself get better was to stay put. “I’ll never forget the day that my dad came to bring me home,” she said. “It was amazing to get fresh air. I hadn’t been outside in over a month. It was just such a new world. It just gave me such an appreciation. “I had all of this and I didn’t realise I had all of this. I didn’t realise I had such a great life. While I did obviously enjoy myself, I just didn’t realise how lucky I was to have all of that. “So I think out of everything that happened, just learning that appreciation was the most valuable lesson that I ever learned. “And I feel like I’ll never take anything for granted again because I’ll just know to think back to that time that I was isolated and think back to that time that I couldn’t do anything for myself when I was relying on everyone else around me. Between friends sending texts on a daily basis to neighbours and family friends bringing home-cooked meals to the house and saying prayers, Clodagh is so grateful to everyone who supported her through this difficult time. Most of all, she's grateful to her dad, Donal, mum, Pauline, sister Aoife (14) and brother Aidan (19) who were there for her every step of the way. And, when she received the good news that her treatment was a success, she had to throw a celebration. 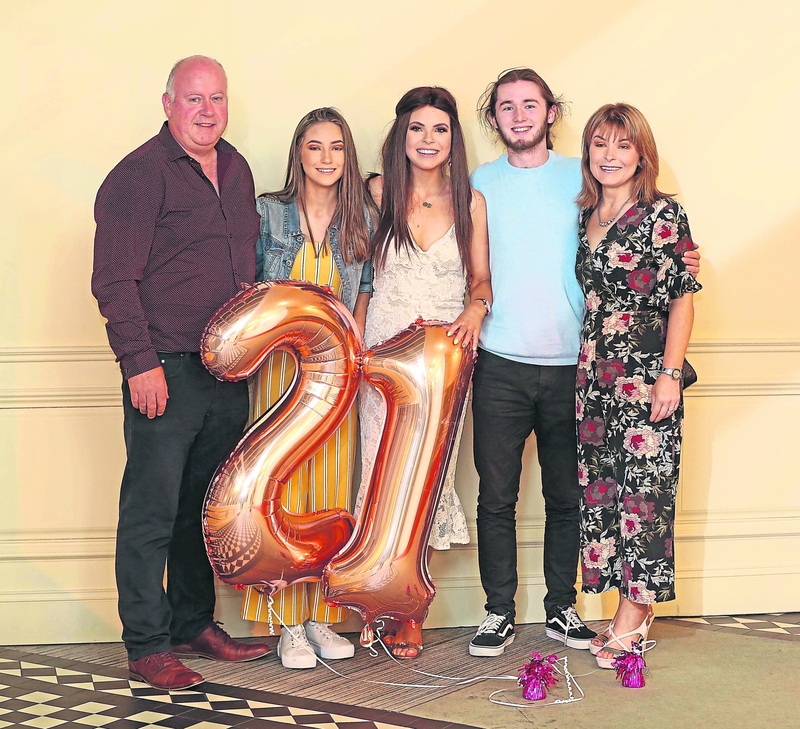 “I got to celebrate my 21st birthday and I feel like it was such a special birthday because… well, first of all, it was my 21st and that’s a very special birthday anyways,” Clodagh reflected. “But it was at the end of everything - the end of all my treatment. And it was a way of bringing everyone who was there for me together and saying ‘guys, look, this is what you’ve done: you’ve got me here today; you’ve made this happen’. “When I was diagnosed, I was diagnosed at stage four. So it could have so easily been the end of the road,” she said with gratitude. “And I was being told ‘we have to get this so quickly because you don’t have much more time to do this’. And if I hadn’t just said ‘right, let’s do it’, it could have been doom and gloom. But it wasn’t.